To start with, I would like to let you know a bit more about the movement. The Refashioners is a project Portia Lawrie from Makery started some years ago, and it is an amazing community challenge. She will give a theme and set up an amazing prize package and basically everyone, everywhere, can participate. I find it a fantastic challenge, not only because it really gets my creativity out, but also because it allows me to meet so many other crafters. And most of all because it inspires me! 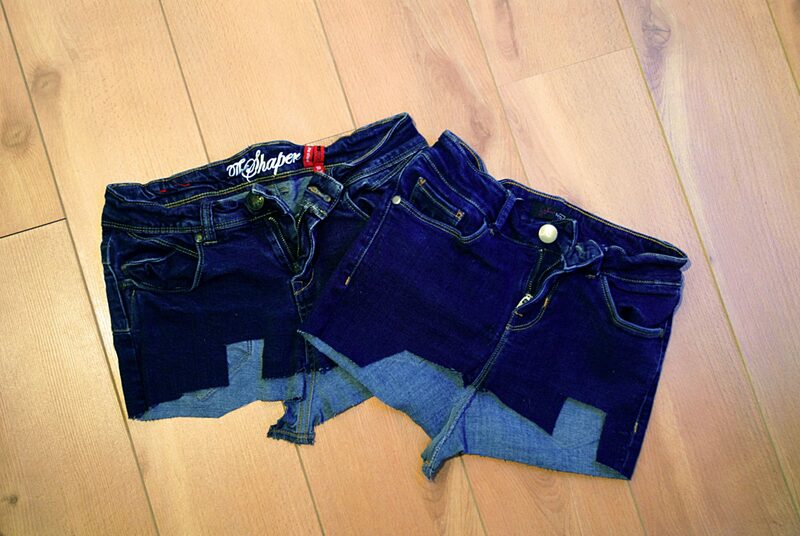 You really wouldn’t imagine how many great ideas people have come up with just to refashion old jeans. But if you’re curious, take a look here. This year I decided I want to join too. I have a bit more experience than last year and I definitely had some old jeans laying around waiting for a project just like this one. I first found it hard to come up with an idea. I wanted to create something wearable. Something I knew it wouldn’t end up exactly in the same place as the old jeans, once it was finished. Eventually I decided that I would make a skirt. 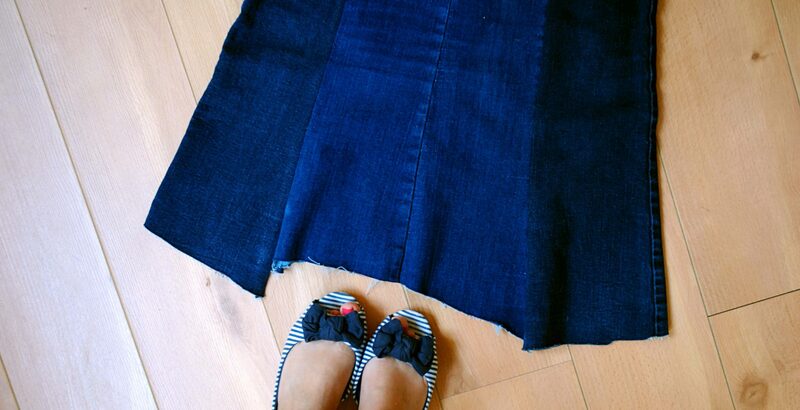 I picked a pattern for it and cut out the legs from two pairs of jeans to use as my fabric. I opened the side seams of each one of the four legs to see if I had enough fabric for the pattern I had picked. While playing around with the fabric pieces, I realized that if I simply sewn together the four legs on their side seams (keeping the bottom hems all to the same side), I had the shape of a dress that actually fitted me. I loved the idea and didn’t want to think about a pattern anymore. This was perfect since I could keep a lot of the original seams and just sew the rest without the need to waste any fabric. I then planned on just finishing the neckline and the hem, and that should be it. However when I tried the dress on with the original raw edges, I loved them so much that I decided to not get rid of them. They’re a bit edgy but very trendy and I think it makes the dress more interesting! I finished the top part by coping a strapless dress I already owned, making the top a bit higher at the front than at the back. I also made some thin straps, that I attached not only as a detail, but to make sure the dress would be comfortable since I didn’t make it (on purpose) too fitted. Finally I added an invisible zip in the back just to help getting it on, even though the fabric by itself probably has enough stretch. And there we go! I’m pleased with the result and I think it will still be possible to wear it for the colder days with a shirt or a sweater underneath. I will be thinking about more sewing projects for the fall/winter but for now I’ll give a break to my sewing machine with the denim. I think it was not too happy about all this heavy sewing! What do you think of my dress? If you want more inspiration for denim projects you can check out my inspiration board on Pinterest (here) and the makings of all these amazing sewing bloggers (here)! Haha wow that’s pretty well done ! 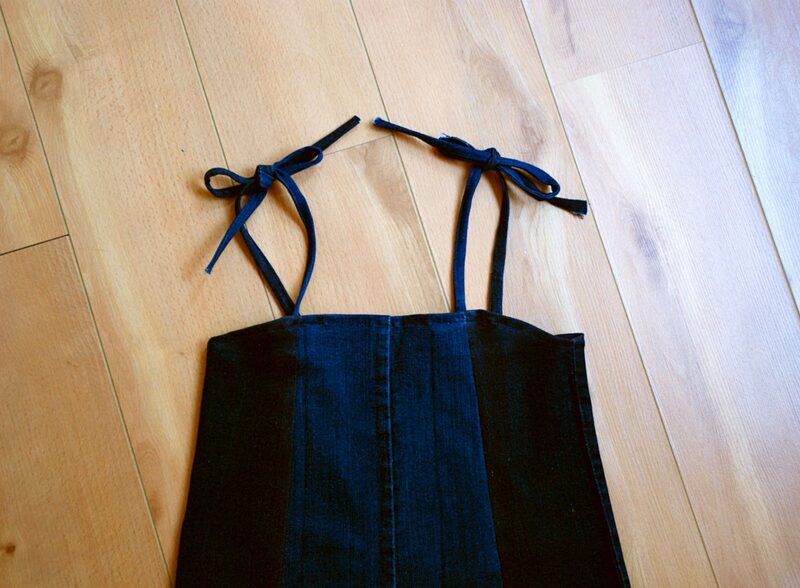 Love it, you look great in your refashioned dress.